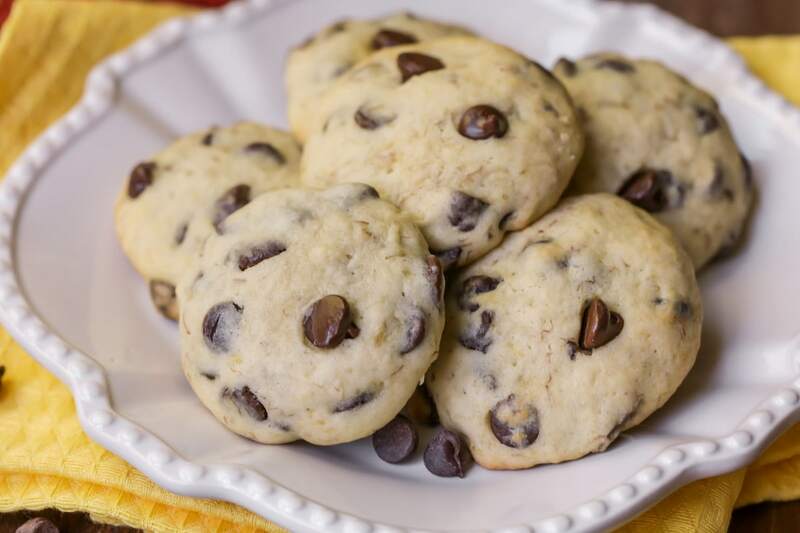 If you’re looking for new ways to use overripe bananas, try banana Chocolate Chip cookies! 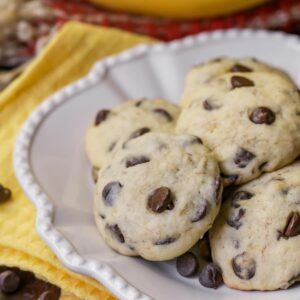 These Banana Cookies are Soft, Cake-like and the perfect treat for any banana lover. Hi, it’s me Lily, again! I’m still in Arizona. Last week I was so sick and I’m all better now. I had Walking Pneumonia! Luckily, I got medicine, though and now I’m all better. I’m having so much fun visiting my friends and cousins. 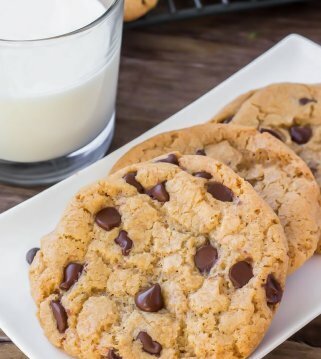 Before we left Texas, we made a recipe for you for Banana Chocolate Chip Cookies. 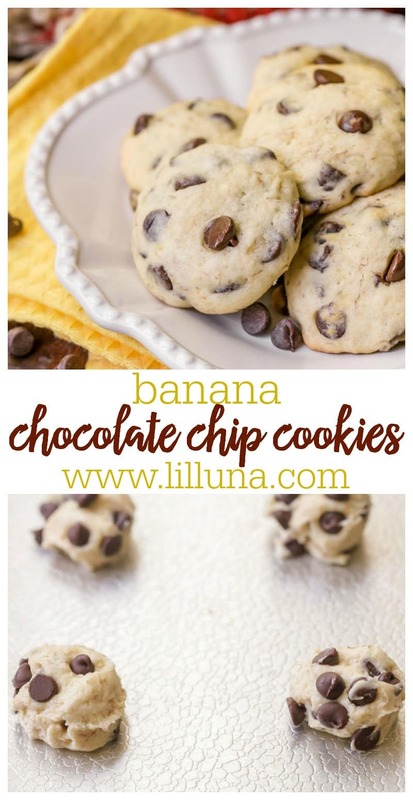 They combine two of my favorite things – cookies AND bananas! My mom says these cookies are perfect for getting rid of over-ripe bananas. You know the bananas are ripe enough to use when they’re brown all over. The more brown they are, the sweeter they taste! And they will mix better with the batter/dough. 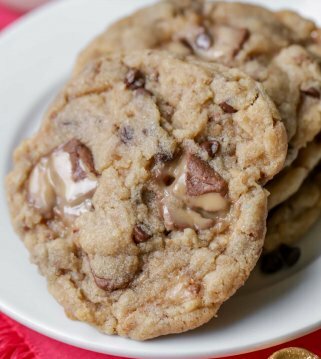 The bananas also make the cookies super moist and chewy! 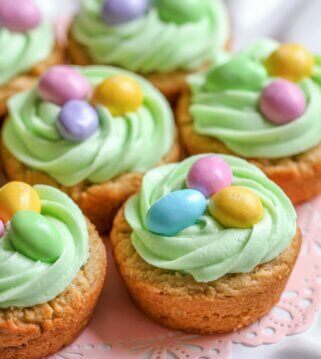 So yummy and so easy! Cream together butter and sugar in your mixer. Add egg, vanilla and almond extract, and bananas and mix well. In a separate bowl mix flour, baking soda, cocoa and salt. Add this to your butter and sugar mixture and mix well. 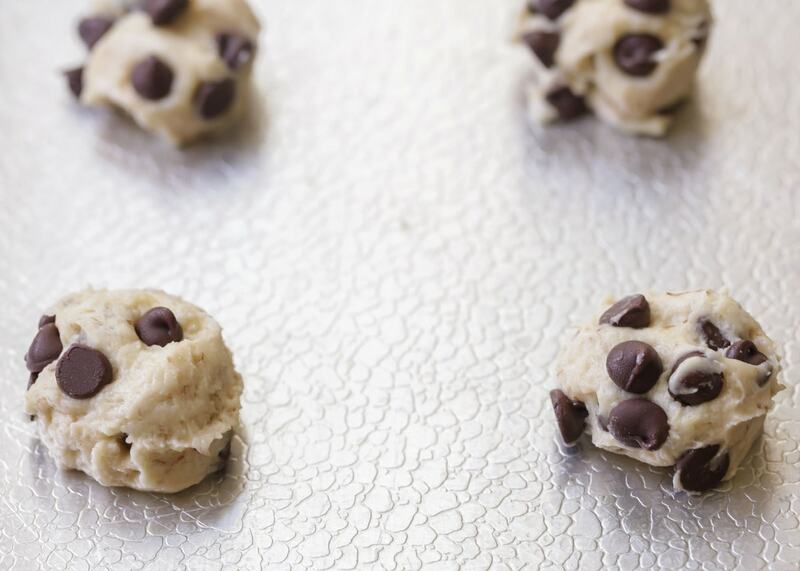 Spoon onto a greased cookie sheet and bake at 350° for 8-10 minutes. I really liked these cookies, but my baby brother, Goo, loved these most of all and had 5 of them!! I hope you like them too!! 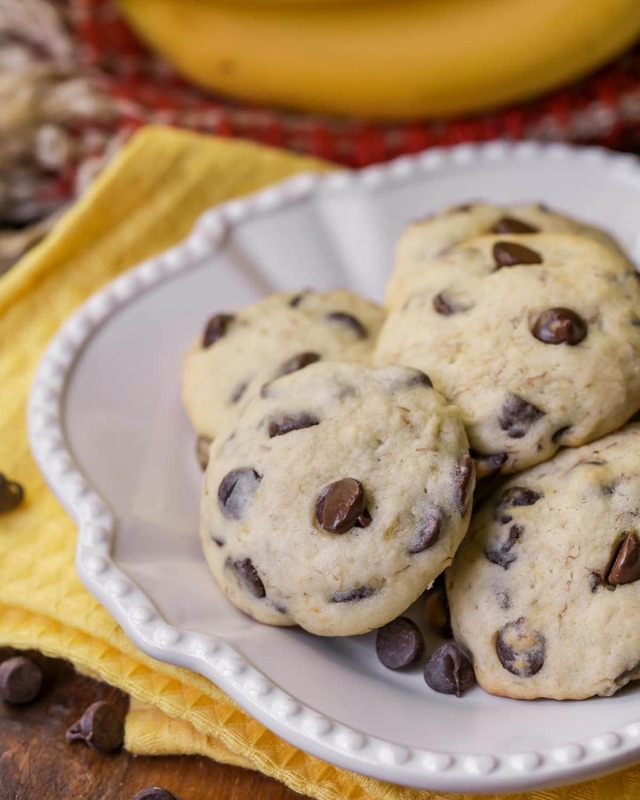 If you're looking for new ways to use overripe bananas, try banana Chocolate Chip cookies! These Banana Cookies are Soft, Cake-like and the perfect treat for any banana lover. In a medium bowl, cream your butter and sugar until light and fluffy. Beat in egg, banana and vanilla until combined. Mix flour, baking powder, salt and baking soda and gradually add to creamed mixture. Stir in chocolate chips. Scoop onto sprayed baking sheets. Bake at 350° for 10-14 minutes, the until edges are lightly browned. I think this would be great for tricking my little picky eater to eat a banana! Thanks for sharing. 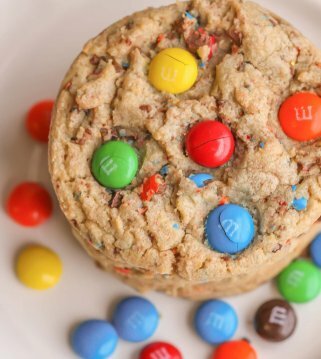 These cookie look delicious! 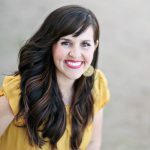 And I can’t wait until my daughter is old enough to help me with my blog like you do!! I love these posts 🙂 Pinned! They look delicious, I just made them they taste very good, but they are a bit flat. I don’t know why this keeps happening but last week I made some chewy chocolate chip cookies and they were not chewy. I follow the recipe but 🙁 I’m from Europe and normally I use grams/ml. I bought some cups though. Add more flour. did the same to me, but when I added more flour they fluffed up. cups are the least aquerate form of measurments if you can, try to convert everythibg to wieght. then theres altitude. you need to make ajustments if you are at an elivation of 5000 or higher. Hi I’m a newbie (not even) in baking sweets. I have failed once before and I’m actually still afraid to give baking another shot. 1. What do you mean by “cream the butter…”? 2. Do I need a mixer? Like I said, I’m a newbie, so I haven’t invested in baking stuff yet. 3. Is this unsalted butter? 4. Can I use brown sugar instead of white? Ask away 🙂 Creaming the butter means mixing with a hand mixer or like a kitchen aid. It gets light & fluffy 🙂 I do like to use unsalted butter when baking & I have not substituted for brown sugar. I would stick to the white 🙂 Good luck!! WOW!! 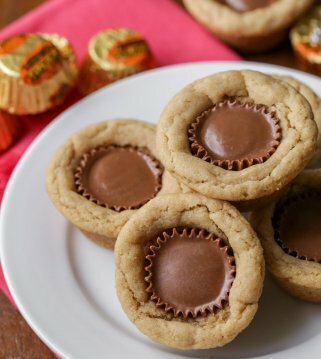 These cookies look and sound incredible!! My kids would LOVE them!! Mine did!! I hope you give them a try & that they are a hit!! Such a delicious idea! This are amazing!! Thanks! They are super delicious!! Oh I bet these are super moist! Love the chocolate and banana together! Flavour is great, but they don’t change shape, I have little funny shaped lumps. They didn’t come out looking like the picture. Oh, I am sorry! I am glad you liked them flavor though 🙂 Thank you for trying them! Do you think this cookies could be frozen? 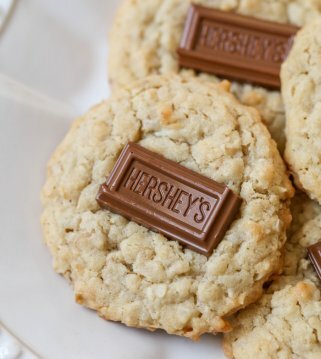 Making this cookies now. In the written out portion you say to bake at 325 but in the recipe form underneath it says at 350. Can you clarify which temperature to bake them at? It’s 350 🙂 I fixed it. Thank you for catching that!